The audience award for the best short film at the Frameline 33 LGBT Film Festival in San Francisco which ran last month went to Maria Breaux director and producer of Lucha, who wrote the screenplay together with Tina D'Elia. The beauty of a short film is that when it is well made everything is there which represents the intention of the filmmaker. Such is the case for Lucha. Lucha in Spanish means "to struggle". Filmed in San Francisco and El Salvador Lucha is the story of two women in love during this time of civil war: Lucha played by Eloisa Ramos and Isabella played by Maria Carolina Morales A. In what is probably their last day together Lucha and Isaibella comfort themselves by fantasizing about the war being over in their life in a spacious home by the sea. Lucha is committed to arm struggle. Her tough exterior is also shown in her inability to be vulnerable to Isabella in love scenes that are symbolic of how difficult it was to be in love in El Salvador in 1982. Shots of an El Salvador is peace are inserted with a grainy Super 8 feel of better times. Contemplative photography and editing by Angela Hudson and an insightful music score by Amal Kouttab contribute to Lucha’s excellence. 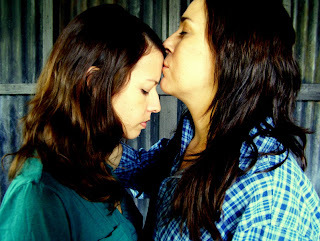 Lucha is a film that shows the beauty and sadness of two women in love during a war that crushed their dreams. The film will be screened at the art gallery Femina Potens (San Francisco) on August 7th for Open Eyes: Queer Film Night. 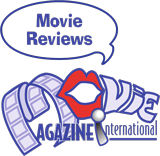 Here now is Maria Breaux and Tina D'Elia who gave an exclusive interview to Movie Magazine about their film. (Interview follows).